Comment: People have been known to spontaneously applaud your sculptures. Isn't that a rare experience among sculptors? Dayton Castleman: Yes, it's probably pretty rare for a sculpture to be applauded! In the case of my work "Rapunzel, Rapunzel," the brief applause was offered after a somewhat formal presentation of the piece at The School of the Art Institute of Chicago. The machine shreds 600 feet of perfectly useful paper, and then stops abruptly, leaving a giant, tangled haystack. It starts as a performer, creating the mass of paper, but as the pile grows the machine diminishes in importance. 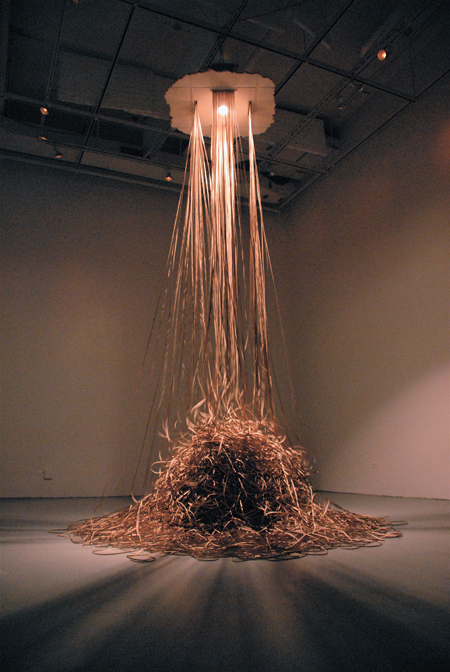 The shredder is no longer the sculpture after it has spent itself—the paper is. It's quite a remarkable transformation from an industrial contraption to an elegant paper cataract! It also creates a lot of waste in four minutes, but it's gorgeous as it does so. This idea of beautiful wastefulness has often caused my mind to wander toward the woman who anointed Jesus' feet with expensive perfume and wiped them with her hair. Most art eschews practicality in favor of something deemed more important, and I choose to imagine that these realities are what the viewers were applauding. Comment: Our managing editor, Dan Postma, loves baseball more than all other things (with the possible exceptions of God, Mira, and Guinness. He would not be surprised that you do sculpture about baseball. But many other people would be. 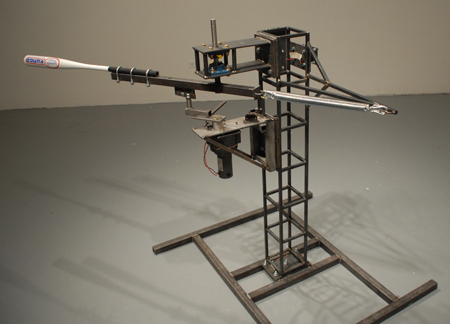 What connections do you see between baseball and sculpture? DC: Well, they handed the Philadelphia Phillies a nice little sculpture at the end of October as a sign of their being World Champions!!! The title of my hitting machine is an old baseball adage: "If you're not cheating, you're not trying." Artists "cheat" in our own little ways, whether by trying to leverage the power of technical skills, or by repeating the use of materials and ideas that have worked in the past. Cheating in any form rises out of the fear of failure, and graduate school caused me to grapple with that fear. The competitiveness that characterizes sports also exists within the culture of contemporary art, and the desire to succeed can tempt you to succeed at all costs, even if it comes at the expense of your imagination, not to mention your character. I have another work, long in progress, in which I was drilling out Louisville Slugger baseball bats and filling them with materials iconic to certain important artists. This references the practice of filling a bat with cork or other springy material to give the hitter an advantage at the plate, but I'd fill my bats with things like steel, Vaseline, lead and crushed fluorescent light bulbs. It's not inherently bad to repeatedly explore in a particular direction or medium, but I wanted to remind myself to not simply rehash what has been well received in the past if it's done at the expense of genuine curiosity and new avenues of exploration. Comment: You curated a show, The Strange Place, at the Alogon Gallery, in which you interacted with the critic James Elkins, recently the author of On the Strange Place of Religion in Contemporary Art. One of the questions raised in that interaction was "Is it possible to use the wisdom gained from decades of active deconstruction towards a renewed investigation into the realm of possibility?" How would you answer that question? What does that question even mean? DC: The question is referring specifically to the cultural sphere and practice of contemporary art. What the sciences have been doing with the material world, artists have been doing to art for the last two centuries: looking more and more deeply, questioning, dissecting, dismantling. This is an important form of inquiry, but the question above is referring to the fact that in all of the disassembling, the atmosphere in art is no longer easily habitable for meaning—not just in the sense of whether a particular work of art has meaning, but in a larger, cosmic sense. Elkins argues that that's just the state of affairs in contemporary art, and in a way he's right. The question above is asking whether that thin atmosphere can change, as artists start to question the absence of overarching frameworks of meaning. My first response would be to ask not whether the art world can again become a "realm of possibility," but whether it is premature to conclude that wisdom has been gained. That remains to be seen, but it's a perfect time for an artist of faith to be involved in this particular cultural conversation. Daniel A. Siedell, a curator, critic and art historian who wrote one of the essays for the show argues in his book God in the Gallery that modern and contemporary art is brimming with altars to an unknown god, and that Christians should be a part of the conversation exploring who that god might be. Comment: If our readers wanted to deepen their own thinking and imagining about sculpture, what would you recommend they look at, listen to, read, or do? DC: Read Daniel Siedell's book God in the Gallery: A Christian Embrace of Modern Art. I haven't been as excited about a book on faith and art in a long time. Go to a museum of contemporary art (see: United States and Canada). But before going, go to the library and do some reading on the artists or genres you will see. Modern and contemporary art requires and assumes this kind of knowledge before engaging the artwork. It's why people often don't get it. Not doing this kind of homework is akin to picking up a book in a language you don't speak, and then complaining that it's rubbish because it wasn't accessible to you. No kidding! Knowing a little French might be a good idea before you burn Les Miserables to keep warm.